HP Consulting Services has developed highly accurate hydraulic expanding arbours to hold engine components for balancing purposes. The designs have been used for low and high-speed applications and are extremely cost effective. Stresses and deformation of the arbor are calculated in house, using finite element analysis techniques (FEA). This method ensures high accuracy, which saves customers valuable time and money. 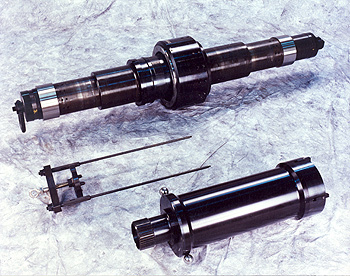 Typically, a hydraulic expanding arbor is actuated using an internal hand-operated piston. Turning the piston displaces the hydraulic fluid, which deflects the hydraulic element thus clamping the engine part. The engine part can be gripped on a snap or spline diameter. Use of a hydraulic arbour gives extremely reliable and accurate results. Customers have found that time is saved during the balancing of a component when compared to an equivalent heat and cool type tool. In addition, the tools have the capacity to expand to meet the wear limits on the engine components, saving the costs of extra tooling.